After decades of building and stabalizing the DeCordova its director Paul Master-Karnik is stepping down. Giuliano photo. Is Sandra Allen barking up the right tree? 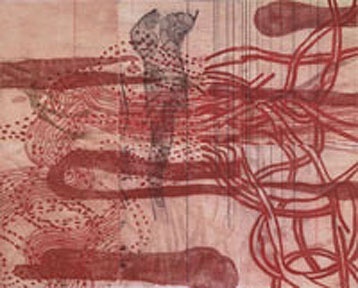 Images courtesy of the DeCordova Museum. Prints by Hiroshige have inspired Sarah Amos. 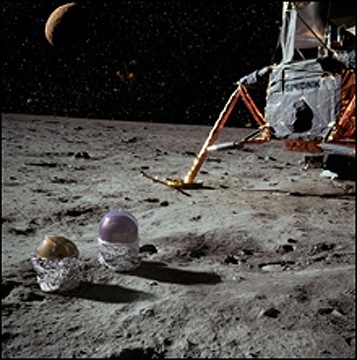 Jeff Yarmouth'spudnik lands on the moon. 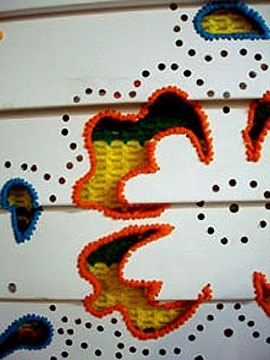 Altered and embroidered aluminum siding detail by Samantha Fields. 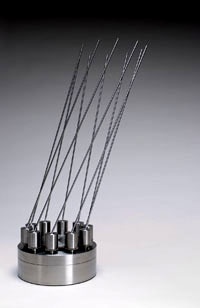 Coffee table kinetic sculptures by Anne Lilly. Elke Morris photographs in Lewiston, Maine. The baskets of Nathalie Miebach push the envelope of craft. Jungil Hong hangs in Providence. 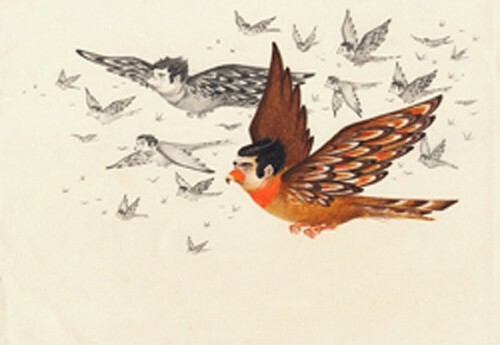 The humanistic birds of Ria Brodell are cute. The Punch of Robert Taplin does naughty things. 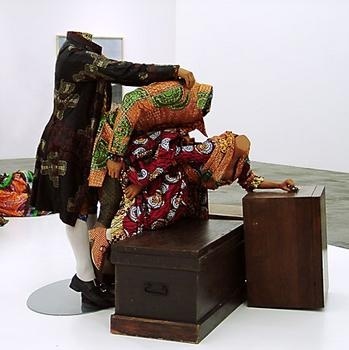 The boffing of Punch recalls that of works by Yinka Shonibare. May 5 through August 12. Once again we much enjoyed the scenic drive along posh Trapelo Road in bucolic, suburban Lincoln. The azaleas were in glorious bloom and here and there on the stately manses workers were busy sprucing up the grounds. Ah, yes, rolling down the windows even on a drizzly May afternoon, we caught the fresh air. Perhaps for the last time we were traveling from the inner city to take in yet another DeCordova Annual in a community where all the women are beautiful and the children are well above average. The catalogue states once again, when will they ever learn, that "The goal of this exhibition program is to annually highlight some of the best, most interesting and visually eloquent artists who work in the region, and to celebrate the creativity and vitality of our own visual arts community." Setting the bar that high with its claims of "the best" is always a disservice to the selected artists as this translates into enormous pressure to live up to such expectations. Why not say something on the lines of "In the past year here are a few artists whom the curators found interesting." The curatorial statement also draws attention to itself in a risky manner that invites a logical critical response. If the curators state that the work shown is "the best" then it follows that the curators are saying that "we are the best curators" because they are in the position to decide just who are the "best artists" working in the region. This notion of proclaiming "the best" artists one had thought passed out of fashion with the demise of Clement Greenberg and his followers. 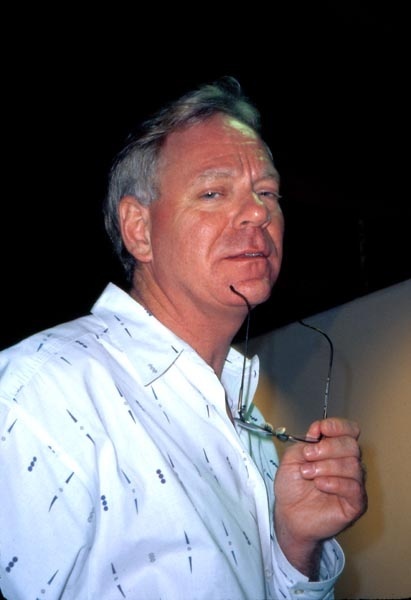 They were always prone to telling us who were the best artists and significantly few of those whom they anointed have withstood the test of time. If anything there has been some piling on to undermine the reputations of that outmoded hegemony. So why offer a new "best" list when the old ones just don't hold. The obvious proof of this is to scan through former DeCordova annual catalogues, just as one might with any annual or biennale, and consider what percentage of the artists so feted are still viewed as players. Has the DeCordova Annual launched any great careers? That would be an interesting survey and perhaps the topic for another time. And what of this particular DeCordova Annual? As I said, it was a most pleasant drive along bucolic Trapelo Road. But yes, to be fair, there were small triumphs and simple pleasures. For the most part, the work was neither significantly better nor worse than what is regularly on view in Boston galleries. In fact, several of the ten artists on view are represented locally. As my peers in the Globe and Phoenix have already commented, the work is generally competent and well crafted. This is exactly what is much emphasized by "regional" curators. There is a high premium set on such intangibles as "quality" "finish" and "craft" of execution. One would, arguably, prefer such criteria as "passion" "insight" "inspiration." We will pass on the issue of 'originality" as that is a much debated notion among critics and philosophers. 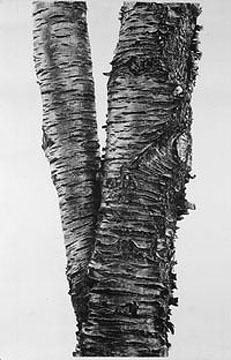 In the matter of "skill" "craft" "technique" or even "hand eye coordination," by the way not necessarily aspects admired in MFA programs anymore, the best in show would have to go to the superbly rendered, grisaille studies of the texture of bark on trees by Sandra Allen. She shows with the impeccably avant-garde Mario Diacono so the old fashioned super realism aspects have clearly been metaphysically upgraded. So when is a tree not a tree? When, here for example, it soars three stories high in the end wall of the museum staircase. It is an interesting and daunting space that has challenged a series of outstanding artists from Deb Weisberg to Randall Thurston and others. If Allen's meticulous drawing represents the high end of the sublime the mechanical mobile constructions of Anne Lilly swing and sway more toward coffee table kitsch. One may just imagine the bourgeois setting for such an item. The spare interior accented by elegant furnishings and a perfect floral arrangement. Visitors to the exhibition appeared to delight in the invitation to gently nudge them into motions which were quite clever but added little or nothing to the last century's rich dialogue on kinetic sculpture and constructivism. Like girls, curators just want to have fun. 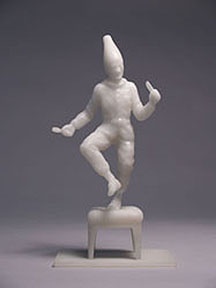 Here represented by the naughty doings of Punch in small white sculptures by Robert Taplin which one would expect to find in an upscale Venetian gift shop. We are amused to see Punch boffing an elegant lady but here it is just too cute compared to the same theme in life scale by the British artist Yinka Shonibare in work we have encountered at documenta and a solo show in Vienna. His work was about post colonialism and this? Jeff "Jeffu" Warmouth's send up of "Spudnik" with a video and several maquettes is genuinely hilarious. Be sure to spend time seeing the entire video even though the museum might have given us a bench to sit on. The work is indeed a very "original" and gonzo, sci fi, hypothesis of the secret life of potatoes and how they launch from dirtworld to outer space. Compared to which the fantasies of Ria Brodell entailing harpie birds and worm fuzzies were just dull. It just all looked so art school and unfunny. There is a ton of this kind of work going around like bird flu. Ditto the edgy stuff by Junghil Hong. Everyone is making cartoony art. And every cartoonist aspires to be thought of not as an illustrator but as an artist. I prefer my cartoons in the New Yorker and not in museums. There is another difficult, challenging nook and cranny in the eccentrically designed museum. This is the narrow, curious space next to the large window above the main entrance. Again, this has been a challenge for an interesting series of artists and the solution here by Samantha Fields is quite charming and wonderful. She has configured it into a folly of the most girly, fru fru, layers of curtains on lacy curtains. That's over the window and in the short space facing it is a wall with aluminum siding which has been customized with a pattern of cutouts with embroidered edges. I don't know what it means but it is interesting and fun to look at. The Annuals always seem to have some regular categories: New media (this year weakened because its curator, George Fifield was sacked), craft, and photography. Nick Capasso is a specialist in sculpture so this is always a part of the mix. But of course in a show such as this with its mandate for "the best" and cutting edge you can't just do straight craft and photography. True to form, it is presented here with a twist. 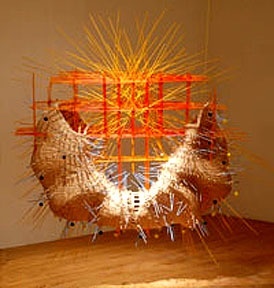 Nathalie Miebach makes over the top baskets. 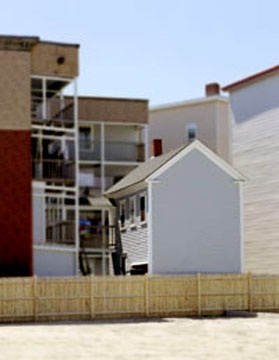 And Elke Morris blurs parts of her images of working class housing in Lewiston, Maine with Photoshop to make them more, well, artsy. 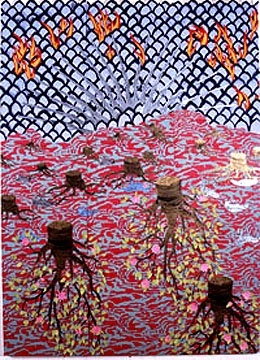 Oh yes, and Sarah Amos states that "In the fall of 2005 I began researching the work of Utagawa Hiroshige, a Japanese printmaker who made a series of 53 exquisite landscape woodcuts called the Tokaido Highway Series 1834." Her work, I guess, reflects that. In many ways, arguably, this is the DeCordova Annual to end all DeCordova Annuals. Because we are relocating to the Berkshires this is more than likely my last review of an Annual. Also, after decades, the museum's director, Paul Master-Karnik, who saw it through to financial stability, significant growth of the collection, and expansion, is leaving. It is inevitable that there will be curatorial change. Perhaps that is welcome and overdue. Or. Plus Ã§a change, plus c'est la mÃªme chose.